I'm rather late to the Hackintosh scene (technically, super early because I hackintoshed while in 7th grade and then took a long break), but since I feel the steps are still ill-documented, despite efforts such as InsanelyMac and other sites, I have decided to write up my comprehensive install log for my system configuration. A bootable flash drive imaged with the Snow Leopard installer and iBoot. In the BIOS, change the SATA configuration to AHCI and sleep/suspend to S3. 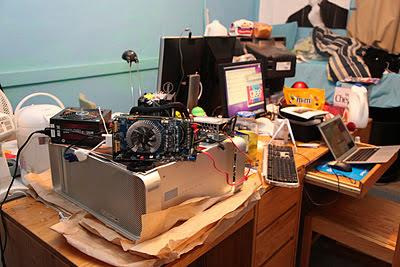 Possibly turn off overclocking to eliminate a confounding variable. Change the boot order such that the flash drive is first. Boot the computer. iBoot should show up with a choice for Install Mac OS X. Select it and press enter. Go through the installation as you would on a normal Mac. You may have to run Disk Utility and format the disk prior to installing. After installing, the system should reboot to the flash drive. Now iBoot should show two options, Macintosh HD and Install Mac OS X. Select the former. 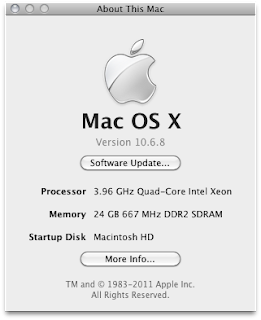 Download the Mac OS X 10.6.8 combo updater from Apple's site and MultiBeast from tonymacx86. Run the system update, but do not restart. Then run MultiBeast with the following options selected: EasyBeast and System Utilities. Eject and remove the flash drive installer. Now restart. Well, that's unfortunate. Looks like EasyBeast kernel panics when trying to boot. At least it boots with iBoot. Install custom sound and ethernet drivers according to step 7 in Lifehacker. Reboot. Guess what, it hangs again. I rebooted with -v and it stops at USBMSC Identifier... Let's actually partition the disk into two partitions so that we can use one of them as a Time Machine backup so we don't have to reinstall every single time. To get sound, use the VoodooHDA.kext in the Post Install folder in Lifehacker. Reboot and voilà! Well sort of; the information in About the Mac is hilariously wrong.